We've been having such good luck with the weather and spaces for our photos recently that I'd nearly forgotten the blogger nightmare that is winter lighting. Arg. As irritating as this is, it would be a crime to let this outfit go to waste without sharing. 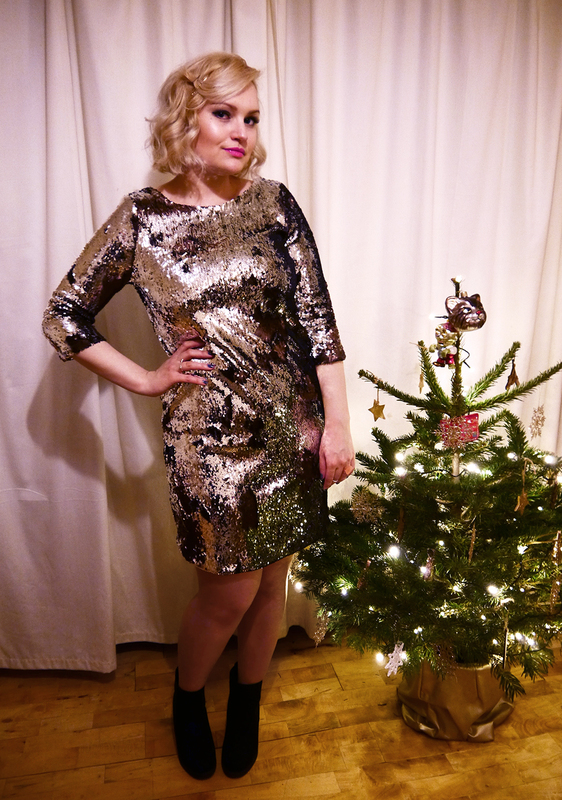 Yep, I thought I was sparkly last NYE in my pink tinsel dress, but I've out-sequined myself this time since I dressed as a human MIRROR BALL! You may remember this dress from my Space themed outfit from May. It was quite well-received but I was afraid to try it again. 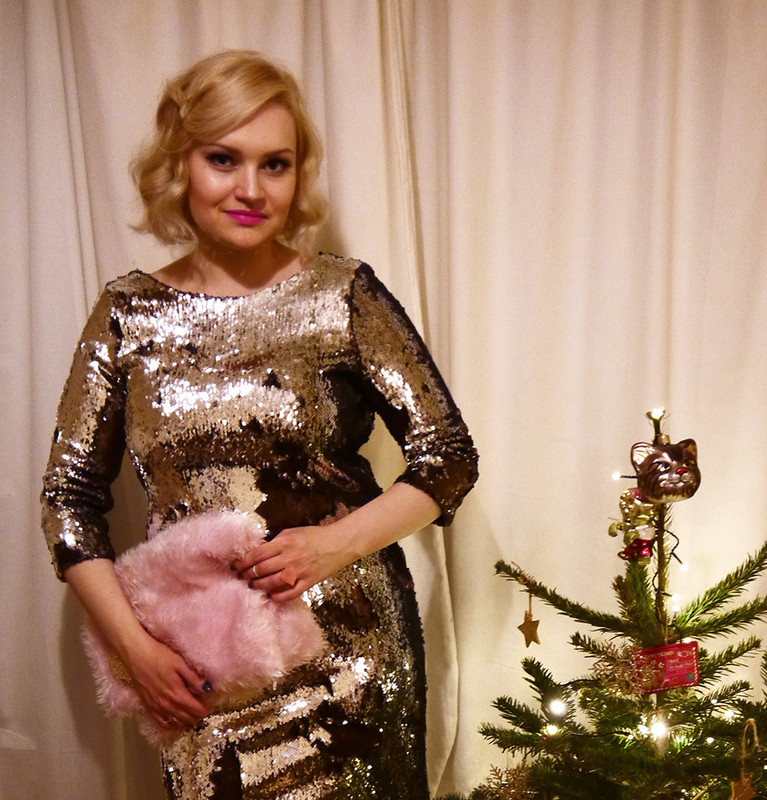 I loved the dress then and I love it even more now but it's not for the faint-hearted. Seeing the two looks side by side, I conclude that I definitely wore it better this time. This is probably because it fits so much better, which is a blessing as I had to forego spanx to fit in our 3 course dinner. 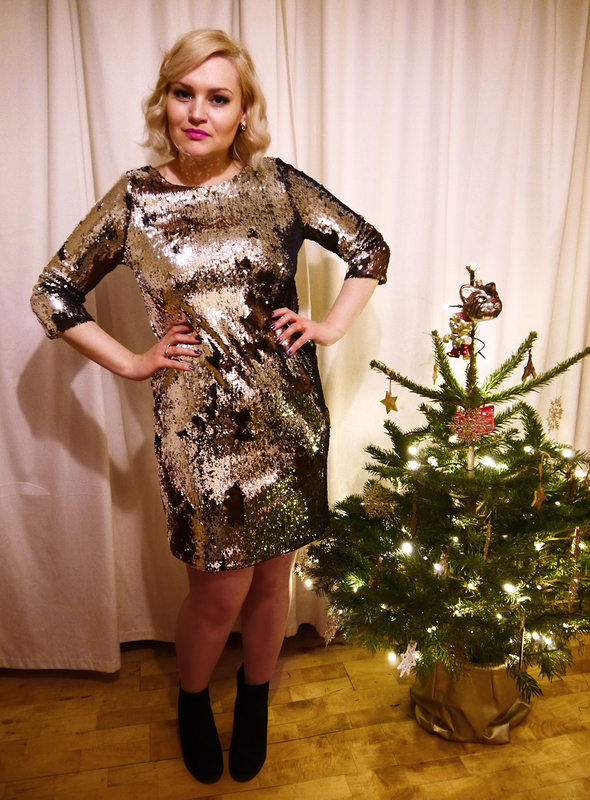 The dress itself is actually two-tone, with bronze sequins on the underneath, so you can brush them in different ways and play around with a bit of a sequin leopard look. 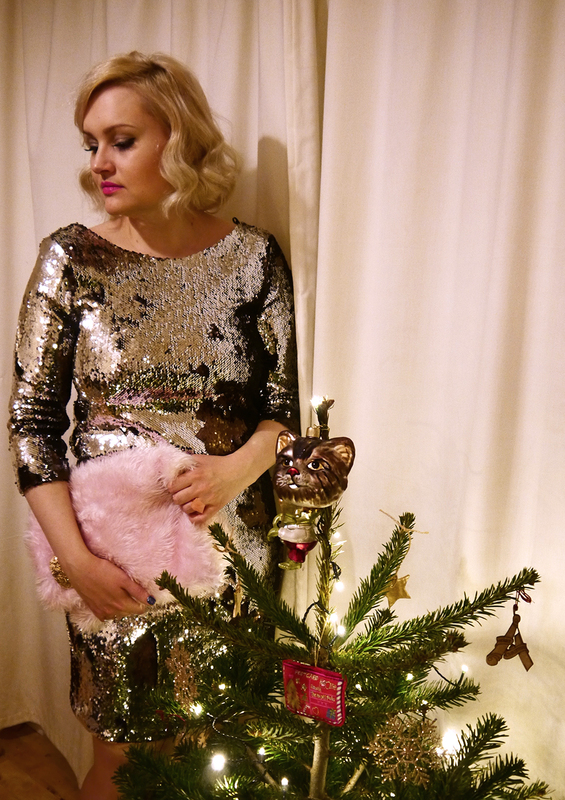 Yes, sequin leopard. Who knew that was a thing? I've forgotten to show off the best part- the back! It's a low scoop neck with a chunky silver zipper to add interest. 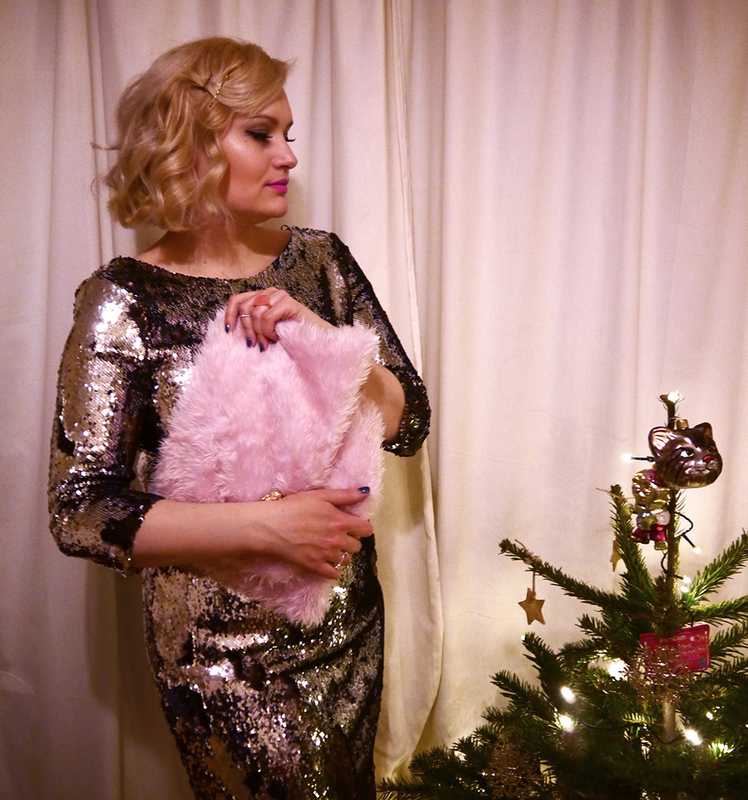 Although less is more with this amount of sparkle, I couldn't resist adding pink (obviously) in the form of my lips and fluffy bag borrowed from Helen. 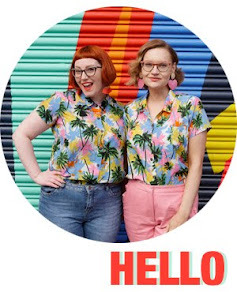 Sinead recently wrote an excellent tutorial on the Wee and Twee blog so you can make your own! 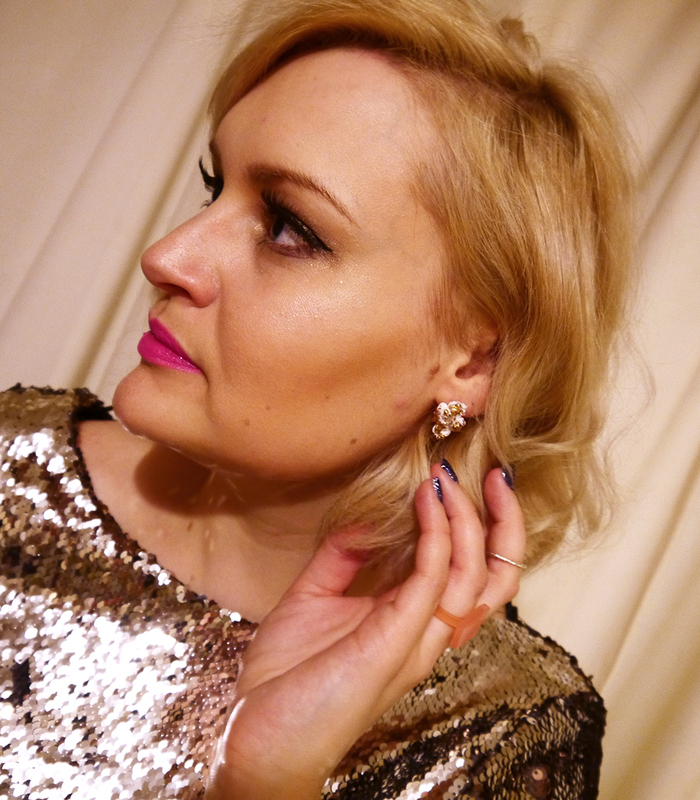 I simply had to include some of my new Christmas jewellery. The stunning earrings are from DJCAD graduate, Dione Bowlt, and I fell in love with them at the Green Tea market last month. The photos do not do the detail justice- they are beautiful, delicate, fluffy looking pieces of ceramic that have a popcorn-like quality. The whole graduate collection is stunning- you should check it out. Again, the pink ring is not shown in its full glory here (boo, winter!). It is a geometric lasercut shape in perspex. The diamond shape, alongside the fact that it only fits my left ring finger, led to a silly faux proposal gag when Helen gave it to me. Alas, our wedding is not to be! We might as well be married, however, as I've just realised this is probably the third New Year that Helen has been my midnight kiss- sad bloody times! Last year we had a retro 2000s house party with our closest girls and the year before we had tickets to a Great Gatsby night in Edinburgh. This year we were also accompanied by 8 other friends to stuff ourselves at Dukes Corner in Dundee and dance the night away to the Beatles band so it's not all weird. It was a really fun, relaxed night and a great way to start 2016. Think I'll be adding "kiss a man at the Bells" to my NY resolutions for 2016 though. Hope you've all had a fantastic start to 2016. Cue the soft-focus shots!